If you're old enough to remember the CHEESE fantasy action "B" movies of the 80's, than Outlander may indeed be your cup of tea and even though it tries to take itself seriously, the premise leaves a lot to be desired. However, if you can suspend disbelief than Outlander is actually an interesting twist on the science fiction genre that pits Vikings against aliens and yes, you heard correctly. 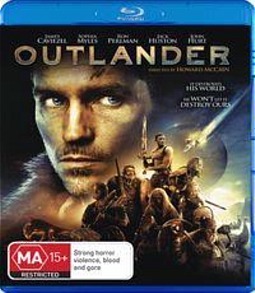 Starring Jim Caviezel as Kainan, Outlander is set during 709 A.D. and when his spacecraft crashes on Earth, his day goes from bad to worse. Although he is the only survivor of the crash, he soon stumbles upon a village that has been decimated by a creature called the Moorwen which his craft was carrying. Before he can hunt down the creature responsible, he is captured by Viking warrior Wulfric (Jack Huston) and taken to his King (John Hurt) for judgement who believe that this strange man was involved in the destruction. To compound the situation, if answers are not found and the creature is destroyed, Gunnar (Ron Perlman), another powerful leader will hold King Rothgar responsible. From here, the hunt begins and even though at times Outlander is reminiscent of Predator, it even has shades of Beowulf from its setting and even characters as they attempt to thwart this powerful creature. Although the movie is steeped in action and gore, there is even a touch of romance between Kainan and the Rothgar's beautiful daughter Freya (Sophia Myles) who also happens to be the person Kainan needs in gaining the trust of these ferocious Viking warriors. Director Howard McCain successfully builds the suspense in the movie and like the aforementioned movie Predator, the Moorwen is only briefly seen at the start but as the film progresses, the viewer is given more glimpses of this creature and thankfully, the special effects are rather impressive for a relatively low-budget action sci-fi flick. Of course, the star of the movie is Caviezel who successfully portrays his homeless character from the stars perfectly and of course Huston who makes a great yet clichéd Viking warrior. Outlands is a fun story, yet ultimately forgettable, however for the time spent watching this flick, those lovers of action will be caught up in the excitement of the hunt but just don't expect any awards from the Oscars or the Golden Globes. On Blu-ray, the high definition looks good but is not that spectacular, however it still has sharp images, strong blacks and an impressive colour palette, even though it's set during the dark ages. The audio suits this action sci-fi film perfectly and certain moments will be blaring out your surround sound speakers but of course, it needs to heard loud to be thoroughly enjoyed for that added level of escapism. Lastly, Outlander contains a healthy dose of extras from commentaries, deleted scenes, visual effects, trailers and the like which are probably more catered to the true fans of the movie than those casual watches. Nonetheless, it's good to see Warner releasing some impressive extras. At the end of the day, Outlander is a combination of a variety of different action and science fiction movies that although is not the most original story on the block, it's still a hoot to watch!